Professor Ueno speaks these words to his faithful dog before boarding the train to work every morning. And every afternoon, just before three o’clock, Hachi is at the train station to greet his beloved master. One day, the train arrives at the station without the professor. Hachi waits. For ten years, Hachi waits for his master to return. Not even Yasuo, the young boy who takes care of Hachi, can persuade him to leave his post. Hachiko Waits, a novel inspired by a true story, brings to life the legendary Akita who became a national symbol for loyalty and devotion. This is a must-read for dog lovers of all ages. 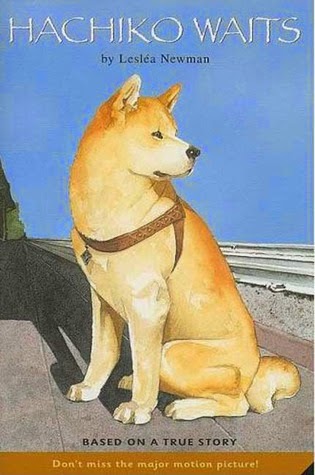 Hachiko Waits is a 2005 Bank Street - Best Children's Book of the Year. The writing level is middle grade or slightly younger. The book is approximately 100 pages and has illustrations. It’s based on the true story of a dog in Japan who spent 10 years at a train station, waiting for his owner to come home. The story does deal with death and sadness, but it’s written in a way that most children could probably handle. There is a happy ending. The book is set in the 1920s and shows elements of Japanese culture. It would be perfect for a kid who is interested in nonfiction stories, animals, history, or Japan. He waited for 10 years? That sounds so heartbreaking. It sounds like a really great and moving story for middle grade readers, but I am actually going to recommend it to my mom. One of her favorite stories is about Greyfrairs Bobby, a story about a dog guarding his master's grave, and she would love this. This sounds really good! And I agree with the above comment about Greyfriars Bobby. The cover is absolutely beautiful! Oh, wow!! My daughter would probably love this book! I'll have to pick it up for her birthday. FF Friday: In Which My Blog Is Featured!